A stone's throw away from the American border, a million Indians call it home. It’s so near and yet so far. It’s a country spanning 5,514 kms and six time zones from east to west. Its land area, third only after Russia and China, could contain 18 countries the size of France or 40 United Kingdoms. Oceans on three sides surround it and its maritime boundary could circle the earth more than six times. And nearly a million people of Indian origin call it home. The country? Canada, of course! It’s America’s closest neighbor, that perennially forgotten cousin. Canada and America are both nations in North America, yet the Land of the Maple Leaf is overshadowed by its flashier sibling. It’s within shouting distance of New York. In fact, stand on the Canadian side of the Niagara Falls and you can see, almost like a mirror image, American tourists waving from across the border. Yet few Indian Americans have connected with their desi biradri across the border – socially, culturally or economically. Indians have been coming to Canada since the 1890’s and though Lake Ontario may not have Lady Liberty holding up her lamp, this country is one of the most immigrant-friendly nations in the world and quite partial to Indians. Ten percent of Toronto’s population is South Asian, the highest proportion outside India. Indeed, at a time when America is turning increasingly paranoid and inward-looking, closing its doors to anyone who’s brown or has a strange-sounding last name, Canada is spreading out the welcome mat and turning on the porch light. The Indian community in Canada traces its origins to Vancouver in the 1890’s when Sikhs worked on the Canadian National Railroad, alongside Chinese laborers. While Vancouver has a large Sikh and Ismaili community, Toronto has drawn people from practically every part of India. 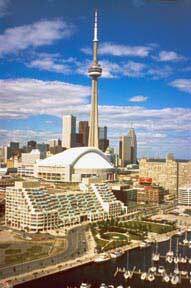 The Indian population in Greater Toronto tops 500,000, the largest in any metro outside India. The 2001 Census recorded a South Asian population of 917,000 and projections are that the population has tipped well over a million by now. Over half the Indian population is concentrated in the Toronto Metro. The 500,000 South Asians in the city constitute fully 10 percent of the metro’s population and are the single largest minority group in the city, larger than even the Chinese and the Black population. The next largest Indian concentration is in Vancouver, which recorded a South Asian population in 2001 of 164,000. Other major Indian concentrations are found in Montreal, Calgary, Edmonton and Ottawa. As we journeyed to Toronto from New York by Amtrak, we encountered several Indian families on the train, headed to meet relatives for the summer. And yes, the very first Indian we saw as we emerged out of Union Square Station in the heart of downtown Toronto was a desi taxi driver. New York or Toronto, some things never change! 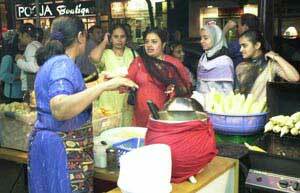 Indeed, walk through Toronto or drive through its suburbs, and you cannot fail to see the Indian presence. The beautiful city with its skyscrapers, its CN Tower, the world’s largest structure, and the lush Harborfront Center, is like a cooler, calmer version of New York with an almost relaxed, European feel to it. At the downtown hotel where we stayed, the Novotel, the manager happened to be Indian. A Pakistani owned the small gift shop in the hotel, and he became our instant guide and advisor. In the lobby we met a young Bangladeshi couple, both academics with new jobs at the university, who had emigrated just a few days earlier and were putting up at the hotel while they hunted for an apartment. The father cradled a little boy in his arms, and looking at these new migrants, you could feel a sense of movement, of being in the midst of a churning sea of immigration. 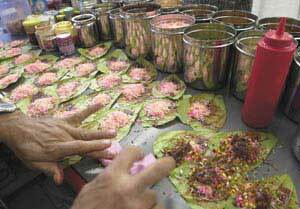 Gerard Street boasts no fewer than five paan shops. When we turned on the radio at random, we caught a Punjabi station, a lively call-in show for drivers; another time on another channel, it was very catchy Tamil bhajans set to Bollywood music. Canada has a significant Tamil population, not only from India, but also hrefugees from the civil war in Sri Lanka, who have found a welcoming home in Canada. In fact, the Greater Toronto area boasts of nearly 30 South Asian ethnic publications, including 16 Punjabi newspapers, six in English, two Urdu papers as well as a few in Hindi and Gujarati. One radio station, CMR, Canadian Multicultural Radio, has been designated exclusively for ethnic communities, and Punjabi, Hindi and Urdu programs are all a large part of it. There are also an estimated 30-40 South Asian radio programs, most of which have bought time on mainstream stations and some of these are very interactive call-in programs in Punjabi, Tamil, Urdu and Hindi. 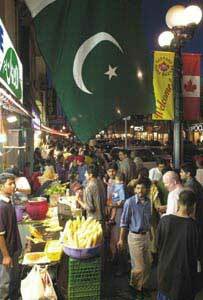 Walk down colorful Gerard Street in Toronto and you see hundreds of sari boutiques, gold jewelry shops, eateries and grocery stores and no fewer than five paan shops! This continues to be the strongest Little India. You will see a microcosm of South Asia – Sikhs in turbans, women with hijabs, Sri Lankans, Muslims from many different countries besides Indians, Pakistanis and Bangladeshi,s as well as Arabs and Afghans. In many areas, the enclaves juxtapose, so that it’s possible to purchase Hindu temple accessories, Sri Lankan curries, hallal meat, or five samosas for $1 – all in the same mall. Traveling to the suburbs, to the towns of Mississauga, Brampton, and Scarborough was even more of an eye-opener. Indians have settled in large numbers in Missisauga, and driving through the town you could see signs that told the story of a nation in change: Nader Hallal Meat, Pakwanchi, Royal Jewelers, Tandoor. We ate lunch at Brar Sweets, a small restaurant franchise in a strip mall, whose owners belong to the Radhaswami sect and are strict vegetarians. The huge buffet boasted many meatless delicacies that we had not tasted even in New York, such as chutney and paneer fritters with a dab of chili ketchup hidden inside the fried center. We were told the food was cooked by elderly Sikh women and no wonder it had such wholesome, home-cooked taste. In all these towns, Little Indias have sprung up in strip malls, and Little Sri Lankas too. You could call them Little South Asias, because almost all the regions are represented. In many places the enclaves juxtapose so that it’s possible to purchase Hindu temple accessories, Sri Lankan curries or hoppers, hallal meat and five samosas for $1 – all in the same mall. Kiran Ahluwalia receiving the World Music Album on the Year. America may have many thriving Indian communities, but nowhere does one see the scores of temples, gurudwaras, churches, mosques and jamat khanas for Ismailis, who are the followers of the Aga Khan. The Toronto area alone has over 20 gurudwaras and over 50 temples, as well as 100 mosques, which cater to Muslims from many different countries. While the Indian population in New York or California is large, neither holds a candle to Toronto, both in size, but even more significantly in proportion of the total city population. Consequently, the different religious institutions have a strong following. 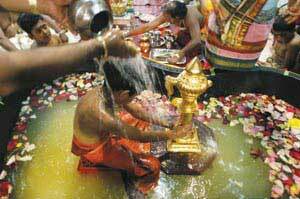 Visit one of the temples on a festival day and you see thousands of devotees and the sheer energy they bring. While some of these houses of worship are grand structures, others are makeshift ones in old houses or industrial complexes, some next to auto shops and Kung Fu Centers. “Toronto is unique in the way of preserved culture with more than 250 organizations which vary from cultural, language, religion to community based,” says Arti Chandaria, an arts activist who has been in Toronto since the 80’s. “Living far away from home this helps in celebrating festivals and religious events, and to showcase artistes within the community.” She points out that individuals belong to multiple organizations, based on their language, religion, community group and cultural interests. 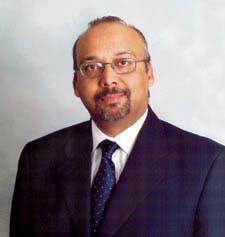 Pradeep Sood, president of the Indian Chamber of Commerce, a national body with business councils in Ottawa and Montreal, which celebrated its 27th anniversary this year, has been in Toronto since 1990, moving from Delhi via Kenya and Tanzania. br/>Indians are the second largest immigrant population in Canada, after the Chinese. India is also the second largest source of new immigration to Canada, after China. In 2003, almost 25,000 Indians and another 12,000 Pakistanis immigrated to Canada. “Unlike earlier, now they are more educated – 75 percent are skilled workers,” Sood says, pointing out that the Indian community is young and vibrant, constantly growing, with over a third of the population under the age of 24. The average household income of Indians in Canada at $54291 (US$41,748), is almost 16 percent higher than the national median household income of $46,752 (US$35,966). Surjit Babra, whose company SkyLink began operating over 20 years ago with a single travel agency, has grown to include several operating companies and joint ventures, including a network of worldwide travel offices representing over 30 major airlines. It also has its own fleet of aircraft to provide international charter flights. 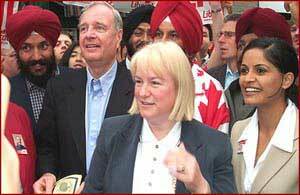 Ruby Dhalla, seen here with Prime Minister Paul Martin, became the first Indian woman member of the federal parliament. Another Indian Ujjal Dosanjh has served as premier of a Canadian province. Canada also has a large community of Ismailis from Africa, who chose to re-emigrate all over the world, especially Canada and the United States. There’s also a significant population of people of Indian origin from the West Indies, from Trinidad and Guyana. Many of them, in fact, had journeyed from Goa to the West Indies and one encounters many Fernandezs and De Silvas. Yet no matter where the sea of immigrants of Indian origin comes from, they generally come into Canada as skilled workers, rather than through the business immigration category, which has largely been used by the Chinese community, who often were bootstrap entrepreneurs. In Canada, immigration is structured on merit, with a point system based on age, profession, education, adaptability and language skills. In Canada, unlike the United States, immigration is a shared jurisdiction between the federal and provincial government. The provinces are interested in attracting people to their areas so immigration fairs are held in different parts of the world. 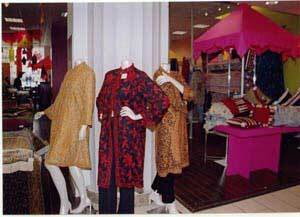 The Sears Department Store featured an Indian costume display in collaboration with the Indian consulate. And what may be useful for Indians in America to know is that Canada is particularly attracted to Indians on H1-B visas, many of whom are forced to return home when their visa runs out and they can’t find employment in the United States. “From a Canadian standpoint, these individuals make fabulous potential immigrants, because they have North American work experience, they are usually working in hi-tech industry and they are motivated to remain in the North American context, and they speak English. How great is that?” says Ramsay. The Canadian government has conducted seminars in the United States targeting H1-B visa holders, working with TiE Tri-State in New York. While Indian Americans and Indian Canadians have not usually been big business partners, Canada is trying to build those bridges by working with TiE to jump start collaborations to expand to Canada. In fact two TiE companies actually ultimately made a business decision to set up operations in Canada. Others, like Satyam Computers, are multinational, with offices in both Canada and the U.S.
Sood, of the Indo-Canadian Chamber of Commerce, acknowledges the lack of Indian Canadian and Indian American businesses linkups with a few notable exceptions. Robin Hood, a mainstream Canadian company, is the largest supplier of atta flour and produces Golden Temple atta, which is exported to America. Since Canada is a rich source of Durham wheat, several mills cater to the Indian food industry. Rubicon is one of the largest companies dealing in processed foods and juices. Several other Indian Canadian grocery suppliers have also entered the U.S. market. Dr. Sen Gelda, who’s originally from Rajasthan, came in 1954 to the United States for further studies in dairy science and secured his PhD from the University of Minnesota. After teaching in the United States he was hired by Borden in Canada. On retiring he started Gelda Foods and his sons joined him in the business, which has four divisions – pharmaceuticals, cosmetics, research lab and food manufacturing and distributing. The company, now in its 27th year is now run by his two sons. Gelda shared his observations as a businessman in Canada for 40 years: “We call it more of a friendly country. People who’ve been to the U.S. find that country a little bit rough, not that friendly and there’s more prejudice there they think. Since 9/11 a lot of these situations are more, especially the Sikh community in the U.S. finds it more – if you have turbans or beards – more prejudice is automatically there.” He says that even some Indians from the Middle East are leaving the United States and moving to Canada for the same reasons. He feels even the climate for business is discouraging. Any sample of food going to a customer has to be registered with the FDA first, and the customer has to be registered with the FDA to be allowed to receive the sample now. A box of rotis he sent to a client in Dallas was destroyed and the empty box taped and sent to the client. While many of these degrees are not recognized in the United States either, Gelda says that because of greater opportunities, professionals find it easier in the United States. Some people in Canada, he says, have to move away from their own field and go into business even though they are doctors or lawyers. While new immigrants take some time to settle down, he says the ones who came in the 70’s have done exceedingly well. In this breathtaking global world, businesses are interlinked in strange ways. Diamonds have become a major industry in Canada and almost $750 million worth of diamonds go to Gujarat in India for cutting. But perhaps the greatest distinction between the Indian community across the border is in the political arena. Indian Canadians have penetrated the glass ceiling of some of the highest political offices in the country, which seems so remote for most Indian Americans, who are still at the fundraising and photo ops stage, with very few actually running for office. Ujjal Dosanjh, who served as premier and attorney general of British Columbia, serves as minister for health in Prime Minister Paul Martin’s government. Ten Indian serve as members in the federal parliament, including Dr. Ruby Dhalla, the first Indian woman to be ever elected to this position. The Indian Canadian community is also entrenched in the cultural and social life of Canada, both with its own organizations as well as mainstream ones. Arti Chandaria, publisher of artsNow, an email newsletter that promotes South Asian art and artists, says, “People say in Canada the multiculturalism is a mosaic,” she says. “I find that the mosaic is important, because it helps people to co-exist, but I would like to see people integrate and interact with each other more.” She sees this interaction strengthening with the younger generation. Pamela Arora, a second generation Indian Canadian whose parents emigrated from Amritsar is the editor of Anokhi Vibe, a glossy magazine aimed at young Indian Canadians, which celebrates their success in music, arts, medicine and technology. “Canada is a hotbed for successful and creative Indo-Canadians,” she says. “ºThey are so many bright, second gen South Asians who are choosing non-traditional and traditional paths as career options. Mitra Sen, who produced and directed the very empathic short film Little Red Dot about cultural understanding; Sen also plays a big role in the ReelWorld Film Festival where many South Asian films that make their debut appearance. Mohit Rajhans has created Filmi, a South Asian film festival that is attached to the Mehndi Masti Masala Festival. Then there’s mybindi.com, a social organization that is well known in Canada for its interaction with second-generation Indian Canadians. Young South Asians are also contributing their pulsating rhythms to Canadian music, including such groups as Riksha and Lal, both in Toronto and the Mantraboys in Vancouver. 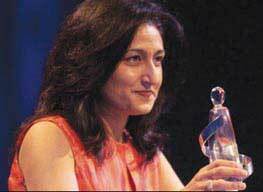 Acclaimed Canadian ghazal artist Kiran Ahluwalia won a 2004 Juno Award in the Best World Music Album category for her latest release Beyond Boundaries. 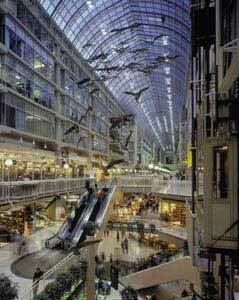 Then of course there are the big names, which are recognized internationally and whom Canada has embraced as its own. Director Deepa Mehta has made deeply moving films from Fire and Earth to the comedy Bollywood/Hollywood, which are viewed as Canadian movies, opening at the Toronto Film Festival to critical acclaim. Writer Rohinton Mistry, who was born in Bombay, now lives near Toronto, and received the Commonwealth Writers Prize for Best Book of the Year for his first novel Such a long Journey and the Giller Prize for A Fine Balance, besides many other awards. M.G. Vassanji, who was born in Kenya and raised in Tanzania, came to Canada in 1978. He is the author of five acclaimed novels, including The Gunny Sack, which won a regional Commonwealth Prize, The Book of Secrets that won the very first Giller Prize and The In-Between World of Vikram Lall, the winner of the 2003 Giller Prize, which awards $25,000 annually to the author of the best Canadian novel or short story collection published in English. Vassanji, whose multilayered, absorbing novels have been very well received in Canada over the years, was awarded the Harbourfront Festival Prize in 1994 as one of 12 Canadians on Maclean’s Honor Roll. This year he was nominated for the Commonwealth Writers Prize for Best Book. It’s hard to think of any Indian American author who has been honored as much in America. Nearly a quarter of Canada’s population is foreign born. Says Vassanji. “People everywhere just accept differences whereas earlier it was seen as an encroachment on their territory or on their country or culture,” he says. Vassanji’s wife Nurjehan Aziz heads TSAR Publications, which is dedicated to bringing the reading public fresh writing whichreflects the global influences, multicultural works pertaining especially to Asia and Africa. The company publishes 6-8 titles a year and Aziz emphasizes that these works are well received, reviewed by mainstream publications and the authors invited on television programs. 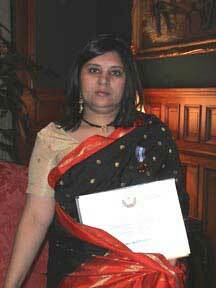 Indian writers who have bagged prizes in Canada include Nalini Warriar who won the Quebec Writers’ Federation prize for First Book for Blues from the Malabar Coast, and Rajinderpal S Pal, author of Papaji Wrote Poetry in a Language I Cannot Read, who won the Alberta Prize for First Work. The noted poet Cyril Dabydeen, who was born in Guyana, has written powerful poetry juxtaposing his life in Canada and the Caribbean, often harking back to his Indian origins. His books include My Brahmin Days and Other stories and Hemisphere of Love. In a review, the Toronto Star called him simply “A gifted Canadian poet.” Not Indian, not Indian Canadian, not West Indian Canadian. And that, perhaps, is the strength of Canada. You can be any color or ethnicity, but in this country, which is remaking itself every day in the mirror image of its changing population, you can be every inch a Canadian. So is this a real Utopia for immigrants – or just a shimmering Shangri-La of the imagination? The opinions are mixed. Binoy Thomas, the editor of The Weekly Voice, an Indian weekly newspaper in Toronto, has seen the gap between promise and actual results in the lives of new immigrants. He insists that immigrants are doing much better in the United States. Many people from India and Pakistan came to Canada during the past few years on the assumption that Canada wants skilled people, but in spite of their qualifications, they did not find work and some even returned home. He adds, “It’s ghettoization in the name of multiculturalism and it’s not working. People always look at you for your turban, they don’t see that under the turban you could have a brain. The problems stem in part from an anemic economy. Says Thomas, “There are far too many immigrants and too few opportunities. But for many, Canada is a place to start over. Rita Sadhwani lost her husband just as they were set to immigrate to Canada from Poona. As a young widow with three little children, it seemed hard to imagine any kind of a future. Yet she gathered her courage and with few resources, left for this unknown new –country. On arrival, she found a job as a substitute teacher and in a few years became a full time teacher in the Canadian school system. Today, she has a wonderful success story to tell. She loves her job and her three children are all grown and doing brilliantly in university. She feels that the plane journey from India to Canada was the best step she undertook, because it enabled her to fulfill the family’s dreams and allowed the children to reach their full potential. With shining eyes, she showed us around the house she has finally purchased, a cosy three-bedroom house in North York with a small garden bursting with roses, lilies and marigolds.